Stocks posted solid gains on Friday, wrapping up their best week so far this year. The Dow Jones industrial average (^DJI) rallied 127 points, the Standard & Poor's 500 index (^GPSC) rose 9, and the Nasdaq composite (^IXIC) gained 3 points. The Nasdaq's 7-day winning streak is its longest since July 2011. By the way, investors get a long-weekend. The market is closed Monday for Presidents Day. Energy and consumer stocks led the advance. 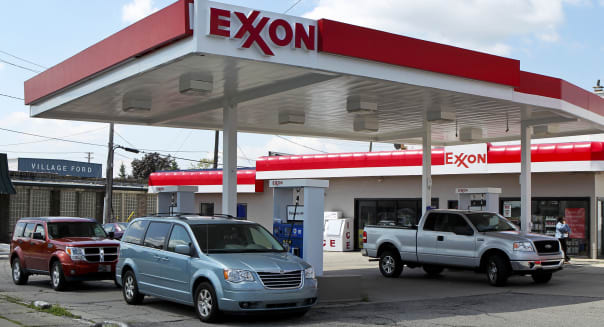 Exxon Mobil (XOM) rose 3 percent and Chevron (CVX) each gained nearly 1 percent. Occidental Petroleum (OXY) rose nearly 4 percent on plans to spinoff some assets into a separate company. And Murphy Oil (MUR) gained 5 percent. It's looking to sell some oil and gas assets that could fetch about $3 billion. On the consumer side, Campbell Soup (CPB) was hot, gaining 5 percent as its quarterly net jumped. Hyatt (H) jumped 7 percent as its net doubled. Rival Starwood (HOT) gained 4 percent. But airline stocks were weak after the cancellation of thousands of flights this week. American (AAL) and United (UAL) both lost more than 1 percent. Analysts say the cancellations will hurt first quarter earnings, but the long-term fundamentals for the industry remain strong. Some of today's most spectacular movers were to the downside. Weight Watchers (WTW) shed a lot weight, losing a quarter of its value. The company posted weaker earnings and lowered its outlook for 2014. The stock is now at its lowest level in nearly 5 years. And GNC (GNC), a nutrition company used by many dieters, tumbled 14.5 percent. It also issued a weak outlook and Goldman Sachs downgraded the stock to "neutral." %VIRTUAL-article-sponsoredlinks%A pair of leading online real estate companies also got hammered. Trulia (TRLA) slid 18 percent and Zillow (Z) fell 10 percent. Both missed their earnings targets. Weak forecasts also hurt Agilent Technologies (A), down 8 percent, and clothing maker VF Corp. (VFC), down 5 percent. And Under Armour (UA) fell 2.5 percent on the Olympic flap over the flap on its uniforms for U.S. speedskaters, who blame the high-tech suits for slowing them down. U.S. financial markets are closed for Washington's Birthday. The Federal Reserve Bank of New York releases its February survey of manufacturing conditions in New York state at 8:30 a.m. The National Association of Home Builders releases its housing market index for February at 10 a.m.